2016 Campaigns Will Spend $4.4 Billion On TV Ads, But Why? : It's All Politics TV ads drive name recognition, but it's uncertain exactly how much more they do than that. Yet spending on them will hit record levels in the 2016 cycle. 2016 Campaigns Will Spend $4.4 Billion On TV Ads, But Why? 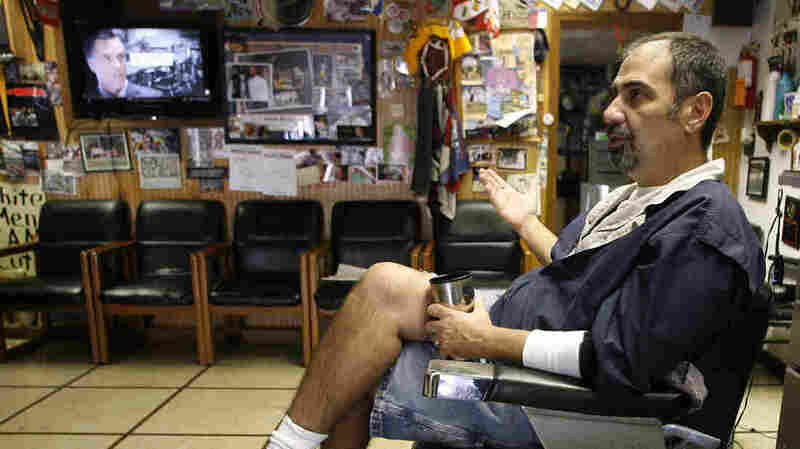 Thomas Checkler, owner of The Old Village Barber in Worthington, Ohio, discusses the impact that the barrage of political ads have on him and his customers during the 2012 presidential election campaign. Former Florida Gov. Jeb Bush's superPAC has already raised more — in the first half of a non-election year — than Obama's main superPAC did in all of the 2012 cycle. The latest big TV ad buy in the 2016 presidential election — on Ohio Gov. John Kasich's behalf, totaling $375,000 — is worth more than seven times the annual median U.S. household income. There have already been seven times more political ads in the 2016 election than at this point in the 2012 election, according to Elizabeth Wilner, senior vice president at Kantar's Campaign Media and Analysis Group. Or just try to digest the aggregate numbers. For instance, political TV ad spending will top $4.4 billion for federal races this year, up from $3.8 billion in 2012, Wilner estimated. Yet TV ads seem to have only small effects on how Americans vote. So why do campaigns spend such huge chunks of their budgets on television spots? It's the need for name recognition, at first. Later on, fear, habit and the hunger for the small sliver of votes at play also drive the huge spending. TV ads (and complaining about them) are a time-honored tradition of elections, and for good reason. Let's start with what TV ads do well. One is that they reach a lot of people — 87 percent of people over 18, as Derek Willis wrote for the New York Times earlier this year. No other single medium comes close. And for candidates who need to get the message out that they're even running, that's important. Because TV ads reach a lot of people, they also are super effective, dollar for dollar, in boosting lesser-known candidates. For this reason, challengers in House races benefit more from ads than incumbents because those ads give a candidate the big lift of simply making their names known, political scientist John Sides wrote in 2011. So in the crowded 2016 Republican primary, that will drive a lot of spending, as candidates struggle for oxygen. But incumbents still spend big on ads. President Obama and his supporters in 2012 spent more than $450 million on advertising altogether, by one estimate. Hillary Clinton, one of the best-known politicians in the U.S., has already amassed a $45 million campaign war chest, a large part of which will likely also go to TV spending. Once the general election rolls around and the candidates already have voters' attention, the evidence is sketchier (and lots of journalists before me have tried to dissect this question) ... but it appears that campaigns are spending a lot of money on a short-term effect on a small group of voters. When studying the outcomes of the 2012 presidential election, Sides and UCLA political science professor Lynn Vavreck found that while ads had a measurable effect on voter attitudes, that effect was small and remarkably short-lived — it disappeared within a week. In another often-cited 2010 study, Bowdoin's Michael Franz and Washington State University's Travis Ridout found that advertising had meaningful effects on voting in the 2008 election, but they also found that you need a lot of ads (and a lot more than your opponent) for a little gain. "Having a 1,000-ad advantage across the entire campaign, for instance, resulted in about a 0.5 percentage point improvement in a candidate's share of the vote in 2008," they wrote. And as campaigns go increasingly negative in their advertising, there's evidence that those negative ads don't really change voters' minds, as researchers from Rutgers and George Washington Universities found in 2007. And even if your ads are effective, they're chasing a small group of people. In the big races like the presidency, campaign advertisements work only at the margins — they might affect the (very) small share of people in the middle, but lots of Americans will fall in line with their parties. Indeed, there's evidence that the number of persuadable voters is shrinking, as the number of moderates slowly but steadily declines and voters grow more polarized. So this could mean more advertising dollars chasing fewer voters in general elections. There's another growing problem with TV advertising, says one expert: It doesn't keep people's attention the way it used to. "TV ads are not as effective as they once were," said Donald Green, professor of political science at Columbia University. Once upon a time, people had to get up to change channels or turn down the volume to avoid ads, he said. "In the early days of TV, when people watched more attentively ... you could show your ads to people who would sit right through them." And the ways to avoid political TV ads have proliferated well beyond remote controls and mute buttons. Today, lots of people might fast forward past ads on their DVR or on-demand services, Green said, or they might simply fiddle with their phones during commercial breaks. That means that at some point, campaigns may have to start thinking differently about how to win voters over. "There is some evidence that more and more people are sort of turning off those [TV] ads," said Gregg Phillips, who ran Newt Gingrich's superPAC, Winning Our Future, in 2012. "The younger generation is going to be moved by a different type of ad. They're going to be moved by some enterprising group on Reddit that has found a way to deliver a message rather than on a traditional format." You could argue that part of the reason ads are so expensive is because campaigns don't know how effective they'll be. "In a highly competitive race where candidates are well-known, ads aren't going to make more than a 2-3 percentage point difference, but obviously, some races are decided by 2-3 percentage points, and so you just don't want to give up on that," writes Ridout in an email. Campaigns don't know what the return on investment on any given ad will be, but then, they only care about one return: winning or losing. The one vote that pushes a candidate over the finish line is the vote that matters, so it's priceless. There's also a business reason that campaigns spend so much on ads: campaign consultants have an incentive to push ads, according to Green, because they're in the media business — they not only believe in ads, but they sometimes get a cut of the media spending. One other reason spending is growing: It's an arms race. "We found ourselves trying to match each other in the buying," said Phillips of the 2012 campaign. After winning South Carolina, the campaign soon found itself outmatched in Florida, where Mitt Romney's campaign inundated voters with anti-Gingrich ads. He even compared the spending ramp-up to a military attack. "What [the Gingrich] campaign faced when they left South Carolina and went down to Florida was nothing short of a blitzkrieg. It was a bombing of sorts, a carpet bombing of Gingrich folks, that we have never seen before," said Phillips. And if ads really do have that short-term effect that studies have found, campaigns want to keep the blitzkriegs going, unstopped, to keep those effects going (and to avoid losing ground to opponents, who are launching their own blitzkriegs). But if the general election is an arms race of spending on ineffective ads that only affect a few people, what does that mean? Could campaigns radically pull back their spending with little effect? Could they reinvest elsewhere? They could, says one expert — if they were willing to take the risk of being guinea pigs. And no one is willing to do that. "Elections are one-time things, and [campaigns] don't want to risk not doing everything everywhere," said Diana Mutz, political science professor at the University of Pennsylvania. Because of that, change in how campaigns spend on ads is slow. But there is one clear shift underway in national races: a move away from traditional broadcast ads and toward more targeted digital advertising — the equivalent of switching from a hacksaw to a scalpel. "[TV] reaches a huge audience. But is it reaching the right people?" asked Mutz. Some types of TV advertising, like uber-targeted cable advertising, are in their infancy but promise to target voters not just by neighborhoods (places where young people, Hispanics, or low-income voters live) but on an individual level (certain low-income Hispanic young voters). Online advertising likewise holds that promise and is growing rapidly — far more so than TV, in fact. Digital spending in 2016 could top $1 billion, according to market research firm Borrell and Associates, growth of 576 percent over 2012. Cable spending, in comparison, will grow by only 28 percent, and broadcast TV by 7 percent. And sooner or later, that TV spending could flatten or even fall off. "Spending on TV will deteriorate," predicted Kip Cassino, vice president of research at Borrell. "By 2020 you're going to see this kind of spending approach what used to be spent on TV. It'll be within a billion of TV by the 2020 election." And that's maybe the best indication of how massive campaign ad spending has gotten. Despite all the uncertainty about what TV ads even do, getting "within a billion" of it is, in fact, pretty close.